One of the biggest complaints from homeowners about roofing contractors is they often create a mess in their yard when removing or repairing the old roof. ABM Services & Renovations goes to great lengths to make sure our job sites are left spotless. After we leave, you will never have to call us back to cleanup your property. No shingle pieces, no tar paper, no nails – no debris what so ever to litter your yard. This is because ABM is an Equiptor (New Roof, No Mess) roofer. This means that we use the Equipter RB4000 – a self-propelled roofing trailer specially designed to manage the debris that results from roofing repair and replacement. Its scissors lift function allows us to capture torn off shingles and other roofing materials before they hit the ground. 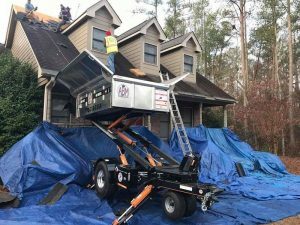 In addition, we will cover the perimeter of your home with tarps protecting you landscaping and catching any debris that may escape the mighty Equiptor. The Equipter trailer is built with wide tires that prevent tire marks in your yard. We take the utmost care to ensure that don’t damage your yard or home and leave your property as we found it. Having a system to catch all the debris means we spend less time on the job cleaning up. In addition, the Equiptor allows us to more efficiently place the roofing materials on your roof so they can be applied. These two benefits make the job go faster. Your new roof will be finished sooner and we can get out of your way and you can enjoy all the compliments on your new roof from your neighbors. Please feel free to recommend ABM to them! Whether you need minor repairs or a brand-new roof, ABM Services and Renovations is here to serve our McDonough, Fayetteville, Sandy Springs, Decatur, Georgia Neighbors. Contact us for a free estimate today on a quality GAF roofing system by calling (770) 282-3700 or completing our online quote request form.